HE IS PLAYING THE JOSEPH GAGLIANO 1774. The concertmaster of the Czech philharmonic, soloist and chamber music player. Jiří Vodička, first violin with the Czech Philharmonic, soloist, and chamber musician, is one of the most prominent and most sought-after Czech violinists. Already as a child he made a name for himself by winning prizes in many competitions, notably in the Jaroslav Kocian international violin competition, the Prague Junior Note, and the Slovak competition Čirenie talentov. In 2002 he won first prize in the international violin competition Beethoven’s Hradec, and in the same year he was awarded a prize as the best pupil attending Václav Hudeček’s violin classes. He later performed with Hudeček in dozens of concerts throughout the Czech Republic. In 2004 he carried off the prize as overall winner of the International Louis Spohr Competition for Young Violinists in Weimar in Germany. In 2008 he brought back first and second prizes from the world-famous Young Concert Artist competition, which took place in Leipzig and New York. Exceptionally, Jiří Vodička was accepted at an institute of higher education (the Institute of Art Studies at the University of Ostrava) at the age of only 14. He studied there under the renowned teacher, Prof. Zdeněk Gola, and graduated with a master’s degree in 2007. Jiří Vodička regularly performs as a soloist with many leading orchestras both in the Czech Republic and abroad, including the Czech Philharmonic, the Prague Philharmonia, the Prague Symphony Orchestra, and the Prague Radio Symphony Orchestra, and, among those in other countries, the Qatar Philharmonic Orchestra and the Neue Philharmonie Westfalen. He also works with such leading conductors as Jiří Bělohlávek, Jakub Hrůša, and Tomáš Netopil. In 2014 he recorded his debut solo album Violino Solo with the Supraphon company. 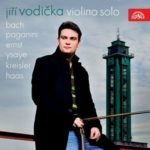 It contains some of the most difficult compositions for solo violin and met with a positive response from critics both in the Czech Republic and abroad. Many of his concerts have been broadcast by Czech Television, Czech Radio, and the German ARD broadcasting company. As a chamber artist he performs together with the leading Czech pianists Martin Kasík, Ivoš Kahánek, Ivan Klánský, and Miroslav Sekera. In 2011 he was invited by the famous violinist Gidon Kremer to perform at his Kammermusikfest festival in Lockenhaus, Austria, together with many world-famous artists. He is regularly invited to perform at leading festivals, such as the Prague Spring, Janáček’s May, the Grand Festival of China, and the Choriner Musiksommer. Since 2012 he has been a member of the Smetana Trio, with whom he has recorded two CDs for Supraphon, and which has won the prestigious BBC Music Magazine and Diaposon d’Or awards. In 2015 he became first violin with the Czech Philharmonic. He teaches at the Prague Conservatory and at Ostrava University. He plays an Italian instrument made by Joseph Gagliano in 1774. Jiri is going to play in many concert halls and stages in Czech Republic and abroad during this seasson. He will play with Czech Phil this fall in USA tour and later on in Japan with solo recitals and chamber music concerts. The second half of the seasson is full of concerts in Germany, China, Ukraine, Georgia and Spain. The concert with Czech Phil and Manfred Honeck . He became the ambasador of the Bechyně’s company since 2018. He wear watches by Rolex. Jiří Vodička published his debut CD by Supraphon Violino Solo which succeed in his home country and in the world. You can fill in your name, email and the message in this form.